Are you looking for some fabulously cute kids storage solutions? 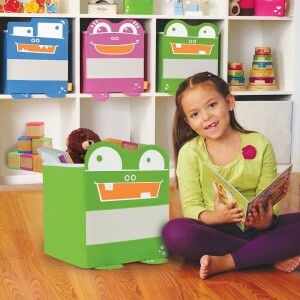 The P’kolino Monster Under-the-bed Storage is perfect for storing all those toys & clothes right under the bed! These fab monsters come in 3 colors Pink, Blue & Green & each one has a not so scary monster face. According to my kids these things keep the real monster away..Sweet we solved to problems! Sized right for toddles and their favorite things like toys, shoes, books and much more! Now having a Monster under your bed is a good thing! If you like storing stuff in cubes then these charming little Monsters are perfect for your kids! You get to choose from three different colors Pink, Green or Blue & they make storing toys look stylish! Fits most standard cube shelves. Large storage for quick clean ups!